For many ramen addicts (*raises hand*), the obsession began with slurping instant noodles over textbooks in college dorms and quick lunches in office break rooms. Eventually, our love of noodles brought us to the cozy corners of local ramen shops where thick, creamy broth is accented by slices of fatty pork, jammy eggs, and bright peppery greens. The pièce de résistance? Fresh, slurpable noodles that absorb and amplify all the flavors in the bowl. ....But what if you’re gluten-free? Luckily, the world of noodles is brimming with alternatives that offer that irresistible chewy texture without sacrificing any of the flavor. Pair them with a gluten-free broth and a few of your favorite toppings for a mouthwatering make-at-home meal. We’ve compiled an honest, no-holds-barred list of our favorite gluten-free noodle options so you can make ramen shop-worthy, wheat-free flavors from the comfort of your own kitchen. Made primarily from rice flour, you may be more accustomed to seeing these chewy, semi-translucent noodles (sometimes called vermicelli) in Pho or Pad Thai, but they taste just as delicious swimming in rich ramen broth. Perfect Earth Organics sells a variety of organic, clean ingredient rice pastas. Soba noodles are thin noodles of Japanese origin made from buckwheat flour. Used frequently in cold dishes and hot noodle soups alike, these flavorful noodles have a similar texture to traditional wheat ramen. Soba does sometimes contain wheat flour, so be sure to check the label before you buy. King Soba makes a superb organic buckwheat noodle (also certified kosher and gluten-free) made from 100% buckwheat flour. 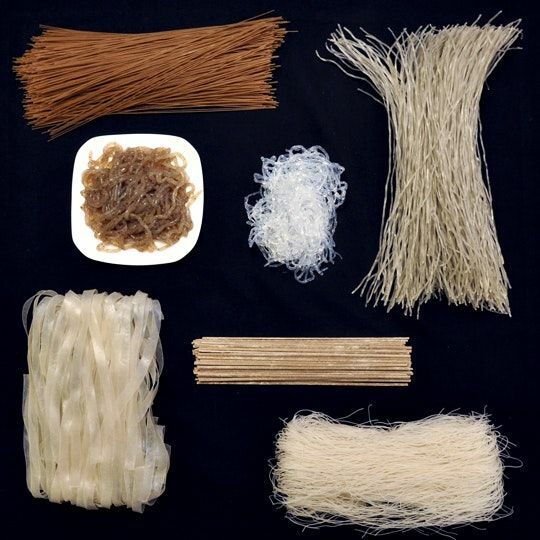 Thin, translucent, and made from starch (often from the mung bean or sweet potato) so-called “cellophane” noodles are aptly named. They resemble clear threads when cooked, and make a wonderful addition to any stir-fry, spring roll, or noodle bowl. They tend to be relatively light on flavor and substance, but have a springy texture that works well alongside broth. We especially love the Harusame from Eden Foods, which is Non-GMO and contains no additives, preservatives, or coloring agents. If you’re on the hunt for nutrient-dense noodles, kelp should be your first stop. Rich in calcium, iron, dietary iodine, and vitamin K, this fat-free noodle alternative is chewy in texture and can be eaten raw or cooked. We’d recommend these Kelp Noodles from Sea Tangle. Full of fiber and low on calories, these Japanese noodles are made from yam starch and have a distinctive chewy springiness to them. They are often packaged in water and sold soft, so it’s recommended that you rinse them before cooking, otherwise the odor can be off-putting. Skinny Noodles has a wonderful organic ramen-style Shirataki Noodle. Curly-cues of zucchini, beet, and butternut squash are decidedly healthy alternatives to grain-based noodles and add a delightful pop of color to any dish. We’ve had the best luck making our own with a spiralizer for the freshest flavor, but if you’re short on time, Cece’s Veggie Co has a fabulous selection of organic vegetable noodle options. Is heat-and-eat more your speed? No judgment whatsoever, here! We don’t currently make a gluten-free ramen option yet (*cough* innovation pipeline 2019 *cough*), but our friends over at Lotus Foods do! If you’re looking to buy a flavorful, nourishing broth from the store, just be sure to check the label for soy, which often includes gluten (both of our organic bone broths are gluten-free!). For those of you with time to spare, try making your own. Homemade broth can be extremely rewarding (if not a bit time- and labor-intensive), and you can control for ingredients like soy. Bamboo shoots, chili paste (GF of course! ), green onions, sesame seeds -- whatever your style, give your ramen a glow up with fresh veggies, seared meat, oils, and spices. For more topping inspiration, see our definitive list of the best ramen toppings.